A review of The Gardener, a meditative documentary by an outsider which is partly about the Baha'i Faith. 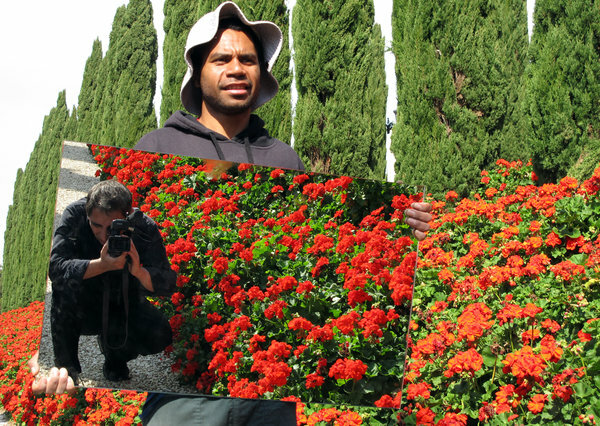 In “The Gardener,” Mohsen Makhmalbaf’s documentary about Baha’i shrines and religious belief, his image is reflected in a mirror held by Ririva Eona Mabi, the gardener of the title. The Gardener opens on Friday in Manhattan. Directed and produced by Mohsen Makhmalbaf; director of photography and editor, Maysam Makhmalbaf; music by Paul Collier and Salar Samadi; released by KDK Factory. At the Quad Cinema, 34 West 13th Street, Greenwich Village. In English and Persian, with English subtitles. Running time: 1 hour 30 minutes. This film is not rated.